...that the Warmind Rasputin may have met the Exo Stranger? ...that Titan has no natural land mass, only consisting of a flotilla of human ships surrounding a large human settlement atop a methane ocean? ...that the Khvostov 7G-0X, the Exotic version of the Khvostov 7G-02, has at least 100 different perk combinations? ...that Rise of Iron is the first expansion for Destiny to have been crafted entirely by Bungie's Live Team? "Six of you went down into the pit. You sought revenge for those I've lost. You slew a god. Crota, with his last breath, he reached out across the night, and now, the night has answered. Oryx, Crota's father. He smells the blood of his son on your hands. We have slain his brood; we have murdered his son! And now, the Taken King comes for us all." 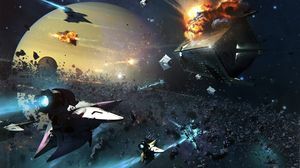 The Taken War was a major, system-wide conflict fought between the Hive, led by Oryx, the Taken King, and all other races in the system. The war began as a direct result of the Guardians slaying Oryx's son Crota, to stop an attempted invasion of Earth. Oryx brought his fleet to Saturn, and began blighting the system with his Taken forces. The war continued to rage even after Oryx's death, as the Taken continued to haunt the system and pretenders arose to lay claim to the Taken King's vacant throne. As of the Red War, the Taken have begun to haunt the Solar System under a new leader, Savathûn. For centuries, the Guardians of the Last City have fought with the Hive to prevent them from invading Earth and destroying the Traveler, only in the recent years have the Guardians been able to make progress in driving the Hive back. The Hive in the system were led by Crota, Son of Oryx who brought about the Great Disaster after the Guardians sought to retake the Moon. Though a fireteam led by Eriana-3, a survivor of the battle, sought revenge against the Hive Prince, her team failed in killing Crota, only destroying his physical form. Only Eris Morn survived that mission and has since then feared Crota's return and has sought the means to destroy him and avenge her fallen comrades. Her fears came true when Crota's servants endeavored to resurrect their master and have him lead an all-out invasion of Earth. Gathering Guardians who listened to her warnings, Eris sought to put a halt on Crota's return by first eliminating his armies' leaders and preventing the ritual to return Crota's soul to the material world. 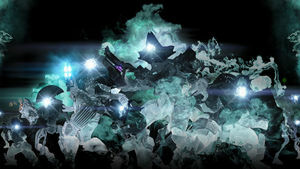 Thanks to the Guardians' efforts, Crota's followers fell and in the Chamber of Night, the Guardians destroyed Crota's soul crystal, preventing his return to the physical world. Despite this accomplishment, Eris knew that Crota could only be killed in his throne world, located within the deepest pit of the Hellmouth and she advised the Guardians to prepare. Forming a new Raid team, the Guardians breached Crota's throne world and battled with the Hive Prince. Despite the Hive God's formidable powers and his Oversoul, the harrowing battle ended with Crota being slain by the Guardians with his own sword. With Crota's death, the Hive were dealt their first real defeat in centuries. However, this victory was short-lived as with his last breath, Crota called out across the stars and his father had heard it. Furious at his son's death, Oryx, God-King of the Hive vowed to avenge Crota and finish what he began by destroying the Guardians. Taking his Dreadnaught and Hive Fleet, Oryx began to travel to the Solar System to destroy the Light's last hope. "The Awoken have played their part. This... was all part of the plan. Guide them, my Hidden friend... It is all up to you now." The Awoken of the Reef were the first to respond to the Hive God's invasion. Queen Mara Sov gathered her fleet to engage the Dreadnaught, Oryx's capital ship, directly in the Battle of Saturn. When conventional weapons failed, the Queen and her Techeuns unleashed the Harbingers, energy weapons of mysterious power. While they tore through the lesser Hive ships, the Dreadnaught was unscathed. In retaliation, Oryx unleashed his Oversoul, which obliterated the Queen's fleet in a single blast, including her flagship and a few of Oryx's own ships. Though no body was recovered, the Queen was assumed dead, and Petra Venj was named Queen Regent. However, the battle succeeded in its primary objective, halting Oryx's fleet and keeping it locked outside of the inner system. Later on, Oryx would have his forces invade the Reef in retaliation for their defiance. Oryx even managed to partially breach and Take the Dreaming City, the mysterious homeland of the Awoken. While in the Dreaming City, Oryx encountered an Ahamkara, Riven, said to be the last of her kind. There, the Taken King Took Riven and begun to create bargains with the wish-making entity. "The base is a loss. We have reports of these "Taken" across the system." Oryx began blighting the system, beginning on Phobos. The Skyburners stationed there discovered strange activity and began to investigate; shortly after, huge numbers of Cabal were being taken and made to fight their comrades. The base commander, Primus Ta'aun ordered a mass evacuation, which caught the notice of the Vanguard. Fearing the activity was a prelude to a new Cabal offensive, they sent the Guardian to investigate. The Guardian arrived at the base as the last of the Cabal were desperately evacuating and was confronted by a vision of Oryx, who declared his intention to eliminate the Guardian and unleashed his Taken upon them. The Guardian barely escaped just as more Taken overwhelmed the base. Oryx's Taken hit Mars at the same time, delivering massive casualties to the Dust Giants, Blind Legion, and Sand Eaters legions of Cabal on the planet's surface. The Taken then began to appear across the system in large numbers, officially beginning the Taken War. As the Vanguard debated on how to fight back against Oryx, Eris Morn warned Commander Zavala that the Taken were unlike any foe they had faced before, and that Oryx's army would only grow unless he's stopped. Cayde-6, meanwhile developed a secret plan to board the Dreadnaught, using stealth technology he stole from Rasputin. Cayde had the Guardians travel to the Cosmodrome to find a stash he hid before the Fallen overran the complex. The Guardian arrived in Old Russia as the House of Devils were in a losing battle with the Taken. Fighting past Fallen and Taken, the Guardian ascended an old Colony ship occupied by the Devils, where Cayde's stash was located. At the top of the Devil's Spire, the Guardians were attacked by an Echo of Oryx but were able to repel it and find Cayde's stealth technology. After helping the Guardian outfit Eris' ship, the Guardian managed to slip onto the Dreadnaught, disable its primary weapon and establish a beachhead. As the Guardians worked to establish a beachhead they also encountered the Skyburners Cabal Legion main battleship rammed into the Dreadnaught. Knowing that the Cabal have been on the Hive warship longer, they would have real field intelligence on finding a way to reach Oryx. The Guardian infiltrated the crashed Cabal ship and learned that Oryx could only be reached through a portal called a rupture and the Cabal already had to team sent to the coordinates, led by Primus Ta'aun. The Guardian was able to catch up to the Primus just as they reached the portal entrance and were on the verge on being overrun. Primus Ta'aun was then assaulted by the Taken and was soon Taken himself. As the Guardians neared the portal, an Echo of Oryx and a wave of Hive and Taken attacked but the Guardian survived but when they tried to pass through the rupture they were repulsed. Eris Morn explained that only an ascendant Hive could enter the rupture. To become ascendant, the Guardian needed to gather Crota's essence; by collecting a shard of crystal from the Chamber of Night, and using the same stealth technology from Rasputin, the Guardian snuck into Crota's throne world and stole the essence in the middle of Crota's death ceremony. Though they were discovered and nearly killed, the Guardian succeeded in escaping with enough of Crota's essence to pass as an Ascendant. Returning to the Dreadnaught, they successfully passed through the rupture and at reaching the second portal rupture, Oryx unleashed his two new Taken Champions, Ta'aun and Baxx. 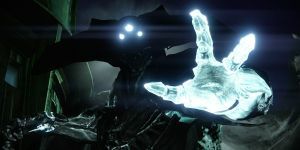 The Guardian defeated them and entered the rupture to the entrance of Oryx's room, where Oryx personally challenged them to come and face him. Despite his dark power Oryx was unable to defeat the Guardian and retreated to the Ascendant realm, leaving behind his sword, Willbreaker. Though Oryx vanished from the material realm, he continued to blight the system. Only by attacking the source of the blights on each planet could the Vanguard direct their attention on ending Oryx himself. Defeating the Taken's Champions helped to narrow down the source of the blights. Cayde-6 tracked down the source of the blight on Earth to an Echo of Oryx hiding in King's Watch, where it was defeated. Ikora Rey discovered a message from Praedyth coming from the Vault of Glass; however, this was a Vex ploy to get the Guardian to remove the Taken that had invaded the Vault, as Praedyth had long since died. The blight on Venus was tracked down to the top of The Citadel, where another Echo of Oryx was encountered and defeated. Commander Zavala discovered another Echo of Oryx on Mars, this time using a secret entrance under Freehold to invade the Black Garden. The Echo was driven from the Garden and was defeated finally on Phobos, in the very room where the War had begun. The Reef aided the Last City in this phase of the war, helping to clear blights and defeat Champions on Earth, Venus, and Mars. However, the Reef was also interested in looking for signs of the missing Queen, and preventing an opportunistic House of Wolves from rising to power again, as they attempted to make a new home on Mars under the leadership of Orbiks Prime. With Variks and Petra's aid, the Guardians were able to track the Wolves down and destroy Orbiks Prime, leaving the Wolves broken and leaderless once more. "We have confirmed it among our number within the Hidden. I have asked Ikora's Warlocks to reach out, and they sense nothing. The Orb is quiet. On the Moon, his shrine is dark and cold. It is true: the Taken King is dead. The Hive's dark god, and his foul son, have been purged from the universe." — Eris Morn, undisclosed report to Osiris. With the blights eliminated, the Vanguard made preparations to once again enter the Dreadnaught, and defeat Oryx for good. Oryx's Lieutenants still lived, most of them residing in the Court of Oryx. Eris had the Guardians depose the Court, as well as eliminate The Infantine before it could be infused with Taken power. Soon, there was none left but Oryx himself, as well as his closest allies, the Warpriest, Golgoroth, and his daughters Ir Anûk and Ir Halak. With the Court soundly defeated, the Guardians used the rupture there to progress deeper into the Dreadnaught, killing his remaining Court one by one and finally confronted the Taken King in his true gigantic form. In the pivotal battle for the sake of the system, the Guardians destroyed Oryx's subjects and used his captured Light against him, defeating Oryx and ending his threat once and for all. "The Taken King is dead. Yet his armies writhe and claw at our worlds." The Taken War did not end with Oryx's defeat, unfortunately. The Taken continued to persist despite the loss of their master; though without Oryx's will to follow they began to slowly decay, they remained a significant threat that the Guardians had to continue fighting. With the Osmium Throne vacant, some powerful Hive and Taken saw an opportunity to seize it for themselves. One was Alak-Hul, the Darkblade, a Hive Knight who Oryx had considered a foster son. Before Alak-Hul could break free of The Sunless Cell where Oryx had imprisoned him earlier for his attempted usurpation, he was defeated by a fireteam of Guardians. Sometime later, the Taken Knight Malok, Pride of Oryx enacted his own bid to claim dominance over the remaining Hive and Taken with his mastery of the blights. Variks, the Loyal received reports of Malok's activities and sent in the Guardian to investigate. Eventually, the Guardian was able to drive Malok out of the Dreadnaught and into the Hellmouth, where he met his end when confronted by a fireteam at the Shrine of Oryx. Noru'usk, Servant of Oryx, a Taken Cabal Centurion incarcerated in the Prison of Elders, had aspirations to become the next King where others (including Oryx himself) had failed but was struck down before he could escape and ascend the Throne. Malok's death, as well as any other powerful contenders were killed before they could take Oryx's place, would officially mark the end of the Taken War. However, the Guardians would have to continue fighting the weakened Taken and Hive forces within the Solar System while also dealing with the Devil Splicers conflict a year later. Pockets of Taken and their blights continued to be active, surviving into the Red War. They thrived within the European Dead Zone and on Io, engaging the surviving Guardians, the invading Cabal Red Legion while infesting the Vex and Fallen. On Io, the Cabal attempted to siphon the remaining Traveler energy within the planet but the Light's energy drew in the Taken which took the Cabal by surprise as a great number of their forces were Taken, as it seems a mysterious entity is directing the Taken in Oryx's absence. Evidence points to Savathûn, one of Oryx's sisters and Witch-Queen of the Hive, and Quria, Blade Transform, a Taken Hydra who was gifted to Savathûn after Oryx Took it. However, thanks to the Guardians efforts, the Taken failed to corrupt the Light and provide a bridge to their world. In the European Dead Zone, the Taken primarily haunt a section of the Dead Zone, the Dark Forest, and engage both the Fallen and the Cabal. Following the Last City's liberation, the Guardians discovered a Taken plot to corrupt the EDZ with Taken energies, threatening their base at the Farm. Fortunately, the Guardians found and destroyed the Blights polluting the land and water of the area but at the center of the infestation, the Guardians battle against a Taken Cabal, Grask, the Consumed, a Phalanx belonging to the Red Legion. The Guardians managed to slay Grask but his appearance as a Taken only worries the Vanguard, as the Red Legion were not present during Oryx's invasion years prior, further confirming that someone, namely Savathûn, has assumed the Taken King's place. Following the Red War and the Hunt for the Scorn, a greater Taken resurgence emerged in the Reef as Riven and Savathûn schemed to wholly corrupt the Dreaming City with a Taken Curse. Though the Guardian managed to slay Riven and stall the Taken surge, Savathûn continues to gain greater control over the Taken and Riven's final wish only strengthens the curse over the Dreaming City.